Instagram is such a tricky place. It’s full of highlight reels and perfect shots, destinations you may never travel to, and images that sometimes leave you feeling less than. It’s also a beautiful place for creativity, inspiration, and connection. Depending on which accounts you choose to follow, your social media experience can leave you feeling uplifted or drained. I made the decision to fill my feed with positivity. I follow food accounts that make my mouth water, videos about animals, and people who are looking to do more than just put on a pretty face. It took me awhile to get to that place, because I felt like I needed to follow certain big-name accounts because everyone else was. I found that over time, I didn’t agree with some of the things they were putting out into the world, and I would have a bad taste in my mouth for longer than I deemed necessary. I started to unfollow those accounts and today social media is a happy, uplifting place for me. Davida is a force to be reckoned with. She’s the voice in my head when I am negotiating with brands and trying to remind myself that this blog is a business for me. She’s very no nonsense, but also helpful, compassionate, and friendly all at the same time. I love her mindset around pretty much everything and she’s a great inspiration. Bonus: She’s hosting a wellness retreat later this year and she just lowered the price! Double bonus: I was on her podcast last year after we met at the Everything Food Conference. You can listen to it here. Les is one of the good ones in fitness. She doesn’t promote false results, she works out like a boss, and she has a wonderfully infectious positive attitude. Her posts and stories feel authentic and she’s a positive force in the fitness space amongst so so many negative ones. You already know that I love Ashley, but it’s not only for her food pictures. She promotes a healthy, well-rounded lifestyle and has been adding in more fitness and self-love content over the years as she is also a certified personal trainer. She never takes herself too seriously and if you like dogs, then just watch her stories. Kelsey is a RIOT. I also roomed with her at the Everything Food Conference and getting to know her made me like her even more. Her foods are great and her stories are even better. They are filled with helpful information, products, and anecdotes, and now that she recently became a mom she tells it how it is in that arena too. If you’re ever interested in doing Whole30, DEFINITELY check out her blog. So Beverley is on here partly because I just like to look at her. HAHA. That being said — she is LEGIT with her workouts and also recently released a program called 30 Days to Fit. It’s not about lifting 2 lb dumbbells; it’s a tough workout for actual results. She’s funny, real, and very no holds barred. May is another Chicago local I love. One, she has beautiful hair. Two, she is an RD who authentically tells it how it is. She creates recipes I would never think of (um, savory oatmeal?) and what I like best is that she will evaluate popular food trends and let you know if all the hype is actually worth the money or if you can save your $25 and leave the coconut yogurt on the shelf. Cass is one of the few people who can make me want to visit Montana. I love all of her outdoor adventures and her happy approach to life and fitness. She’s a huge proponent of empowering women and has started picking up some momentum in the event space recently. Now she just needs to come to Chicago. Bonus: I was featured on her site as part of her Meet The Squad series! Lauren is one of those people who I haven’t met in real life, but I feel like we have. I think it’s mainly because she’s the only one I know to respond to DM’s with actual video messages, but regardless, she’s another strong, no nonsense, JUST LOVE YOURSELF kind of person that I tend to resonate to. She’s one of the few people I will turn the volume up on for stories and whose blog posts I pretty much always read because they are innovative and helpful in many different arenas. I’ve followed Lindsay since I started this blog and it’s been great to watch her family grow. She’s an RD with wonderful meal prep suggestions and inspiration, as well as quick and easy recipes which you know are my favorite. Obviously I don’t have kids yet, but it’s been fascinating to watch hers go through all kinds of milestones and how she raises them. Melissa and I have talked so much on IG it seems like we’ve been friends for quite awhile. She’s cute, funny, and also has tons of delicious recipes she shares on her blog. She doesn’t take life too seriously and if you like cats, then she’s your girl. Kaitlyn and I sometimes seem like the same person, but considering she just joined the Upright Citizens Brigade school, I think she may be a little funnier and more outgoing than I am. She’s also honest and uplifting and her posts not only make me laugh, but remind me to not take myself too seriously. We also love baby animals so much it hurts. ✨ Fun Facts About ME!! !✨ This is exactly what you wanted to read about on a Wednesday, I just know it. 🤣 There are new faces around here (hiiiiiii!!!!) and I wanted to reintroduce myself and also get to know YOU. So let’s do it. 🤘🏻 5 Things About Me: 1. I’m nosy as hell, hence the reason I’m asking you to share something about you today! But I love getting to know people and I want to ask all of the Q’s all of the time. 👌🏻 2. I’m an actor, which makes total sense if you think about it. I did a lot of theatre living in New Orleans, wrote a theatre column for a magazine while living in DC and am now pursuing film, theatre and comedy here in L.A. 🎭 3. I am a tried and true Virgo. Without a shadow of a doubt. And while I’m not too into horoscopes and astrology, I do find the connections incredibly fascinating and I love a good tarot reading. Shoutout to my gal friend, Liz, for always coming through for me on that end! ♍️ 4. I broke my left foot onstage during a dance competition and I danced on it six more times after that. I shattered my growth plate, so now my left foot is slightly shorter than my right. You’re welcome for that bit of info. 💃🏻 5. I cry when I see baby animals because I love them so much it makes my heart hurt. Especially little pigs or dogs of any kind. I also shout to them “my best friend!! !” Which is just ridiculous but I can’t help it. 🐷 6. Bonus: I’d love to get certified in plant-based nutrition and turn my blog into a podcast one day. 🌿 YOUR TURN. Tell me one (or six!) things about you and add your fav emoji! Chrissa was my fourth roommate at the Everything Food Conference and it was so great getting to know her. She is one of the hardest working people I know, especially now that her husband has been deployed for months and she is effectively a single mom with two small boys to raise while growing her business. Not all days are easy, and she makes no claims to that fact. When it’s been hard, she shares about it, and it comes from such a genuine place that I think we can all connect with. Oh, and her foods are good too. HAHA. If you have ever had issues with food, you need to follow Kylie immediately. She is THE anti-diet dietitian and talks about diets and food trends with such honesty it’s beautiful. She involves the mental health aspect of dieting and our relationships with food and while being compassionate about it, still doesn’t hesitate to call out those “healthy living” bloggers who may actually be doing the space more harm than good. This is the personal account of Lindsay from Pinch of Yum and what I love about it is her willingness to be open and transparent about her feelings. After losing her son at 24 weeks, she shared beautiful, but heartbreaking, photos and documented the days with a beautiful series of posts. Her openness showed me what grief looks like and let me know that coping with it is different for different people. She was unapologetic about how often she posted about it and what she had to say and I loved that. They’re currently expecting a little girl and being able to follow on that journey has been really special. Nicole runs the blog Pumps & Iron, which is a great resource for workouts and other health information, but once stories came along and I was able to see how funny she is, that made me like her even more. She advocates fitness, but she’s not SO serious about it, which I love. I’m surprised I’m not following any of these Instagrammers yet! 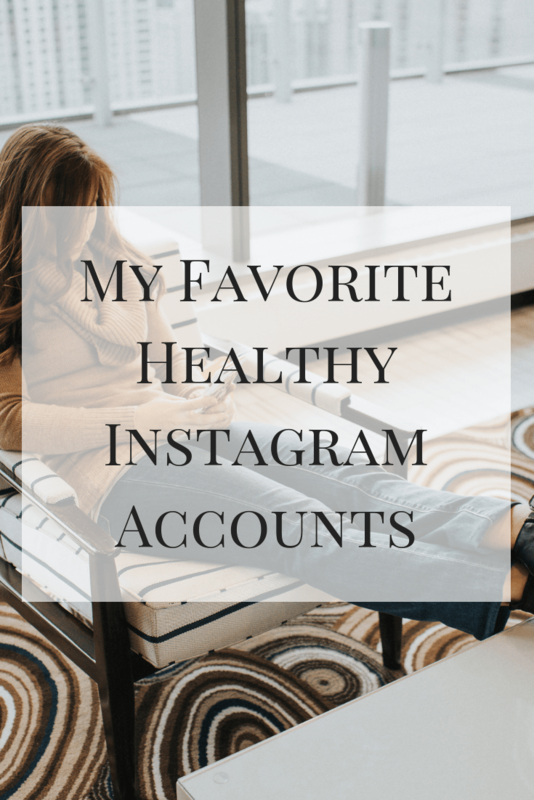 You feature lots of great people, I’m definitely going to check out their accounts in detail! The most familiar ladies to me are Ashley and Chrissa! I LOVE both of them; they’re both so fun and real and I love their ways of speaking to daily struggles/fitness/body image even. Aww I adore all of these; some I’ve been following for years, and some I only recently heard about, but you’ve got a fantastic list here. Two more of my faves are hummusapien and thereallife_rd. Alexis and Robyn are the real deal!